Two of the fastest-growing Indianapolis-area private companies are being run by Butler University Lacy School of Business graduates, the Indianapolis Business Journal reported in its July 18-24 edition. GreenLight LLC, which ranked No. 6 in the IBJ’s “Fast 25,” is headed by CEO Russell Hughes ’04, who was a Butler Business Scholar winner. Greenlight sells collectible diecast model cars. Williams Creek Management Corp., No. 13 on the list, is run by President Neil Myers ’99. Williams Creek specializes in natural-resource construction—projects where communities want to meet regulatory requirements associated with the Clean Water Act and create something practical and beautiful. “Huge congratulations to both Russell Hughes and Neil Myers for successfully leading the tremendous growth of their companies,” said Steve Standifird, Dean of Butler’s Lacy School of Business. “I’m delighted to see Lacy School of Business alums having this type of positive impact in the local business community." According to the IBJ, GreenLight has grown 199 percent from fiscal year 2013 to 2015. The newspaper reported that to build the business, GreenLight put together a strategy to add licensing agreements with the likes of the Elvis Presley estate, IndyCar and other high-profile entertainment entities, and purchased diecast manufacturer GMP out of suburban Atlanta. GreenLight is now in the process of buying First Response Replicas in Frankfort, Kentucky. In the past two years, it has also grown its relationships with retailers and distributors, adding Walmart and Target to the list of places that sell GreenLight cars. Hughes told the IBJ that GreenLight has several high-end license agreements in the works that should add to the company’s opportunities for retail and promotional exposure. Williams Creek has grown by 125 percent from fiscal year 2013 to 2015, the IBJ said, and Myers was quoted as saying that the company expects similar growth over the next three years. Williams Creek’s projects include things like rain gardens, storm water management systems and pond edge planting systems that prevent soil erosion. In Lafayette, Williams Creek was part of the team that created the Durkees Run Stormwater Park outside Lafayette Jefferson High School. The park is part of the city’s long-term plan to reduce raw sewage overflows and improve the water quality of the Wabash River. Durkees Run prevents sewer overflows by diverting 100 million gallons of storm water from Lafayette’s Wastewater Treatment plant. Myers told the IBJ that early on, it was a challenge to get potential customers to buy into his company’s idea. Two of the fastest-growing Indianapolis-area private companies are being run by Butler University Lacy School of Business graduates, the Indianapolis Business Journal reported. Brandon Gaudin ’06, former voice of the Butler Bulldogs men’s basketball broadcasts, will be the new voice providing play-by-play for Madden NFL 17 video games. 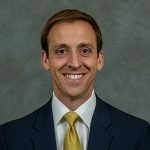 Gaudin will be joining the Big Ten Network as a play-by-play announcer this fall after being the voice of the Georgia Tech Yellow Jackets since 2013. 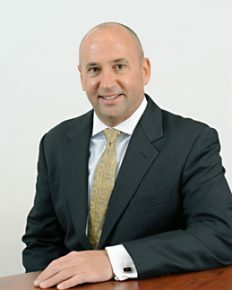 Additionally, he has been named the lead college football play-by-play voice for Westwood One Sports, and will also call occasional NFL games for the network. Gaudin will continue to serve as one of the voices for Westwood One’s coverage of men’s basketball, including conference championship week and the NCAA Tournament. Madden NFL 17 is developed in Orlando, Florida by EA Tiburon and will be available for Xbox One the all-in-one games and entertainment system from Microsoft, Xbox 360® games and entertainment system, PlayStation®4 computer entertainment system and PlayStation®3 entertainment system on August 23. Matthew VanTryon '17 at the Indianapolis Star has more details here. Schwitzer is Gone. Long Live Schwitzer. 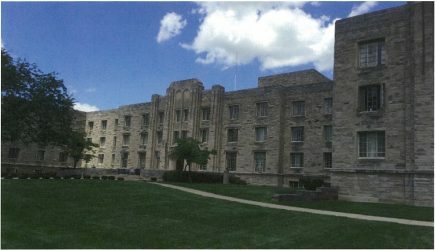 Schwitzer Residence Hall came to life in 1956 and for 60 years was called "home" to many Butler alumni and current students. Demolition of Schwitzer Hall was completed March 1, 2017, and construction of the new residence hall is currently underway. Although Schwitzer Hall has been removed physically, its ashes will be spread throughout campus and it will continue to serve a relevant purpose throughout the Butler University grounds. In the early stages of construction, bed frames, mattresses, chairs, and desks were removed from Schwitzer and donated to Goodwill. Existing doors, hardware, and equipment were also removed. These will aid in repairs for other Residence Halls throughout campus. The original stone entryway arches and sections of the building facade were removed and preserved. These parts will be incorporated elsewhere on campus. Thus, beloved Schwitzer Hall will continue to live beyond its useful life. As Schwitzer's walls and floors were taken down, its remains began to fill the site of 750 West Hampton Drive. As part of the LEED building process, all existing brick, concrete, and stone will be recycled onsite and used as backfill for the new residence hall. The bones of Schwitzer will continue to serve a purpose as the foundation for the new facility. Shiel Sexton Company is General Contractor for the new $30 million residence hall, which is being developed by American Campus Communities. This is the second phase in the new frontier of modern student housing, a continuance of Fairview House. The new student housing will contain 660 beds in apartment-style units, a fitness center, study lounges, game rooms, a large community meeting space, and much more. In the end, this traditional residence hall gives way to a modern facility, but the ashes of Schwitzer Hall will lay the foundation for a new place that will soon be called "home" to many at Butler University.